Happy Saturday! Wow, where did the week go? All I remember is lots of sweat and a marvelous concert by Mumford & Sons (best show ever). I only got one good picture because I forgot that my new phone has a "night" setting. Duh. And we were right up front! More details on that later. Because this week wasn't just about the heat wave or beautiful music, but it was also the week that Jessica Brody's My Life Undecided hit the shelves! This sounds like my kind of book. Anyone who knows me well? Just read the description and you'll be nodding your head so hard you'll get whiplash. Yep, that's me. I'm decisionally challenged (love that term!). Sometimes I compensate by making spot decisions very quickly. Like the touch-screen order menus at convenience stores like Wawa and Sheetz? I barrel through those things so fast, because if I don't, I spend forty minutes trying to decide between Swiss and provolone, and then figuring out whether honey mustard or spicy mustard would work better with each choice. The decision tree has too many branches! And it has an awesome trailer! Check it out! Jessica was born in Los Angeles, moved to Colorado when she was twelve, moved back to California after college and now indecisively splits her time between both states. 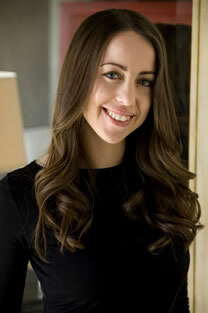 Jessica graduated from Smith College in Massachusetts with majors in Economics and French because she was convinced she wanted to be an “important business woman.” After a brief stint as a strategic analyst for MGM Studios, she abandoned her business background to become a full-time writer. Now she uses her mad spreadsheet skills to build complicated outlines for her books. Appropriately, when writing this book, Jessica couldn’t decide on a title. So she polled 50 of her closest friends to finally come up with My Life Undecided. Visit Jessica at jessicabrody.com. 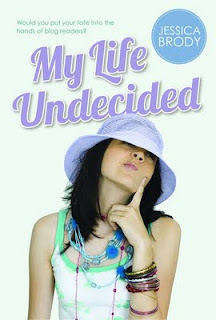 And coming soon: www.MyLifeUndecided.com, where you can post your own undecided questions, poll the community, and get some answers. Sounds like I site I could really use! I’m going to have to say the “Truth or Dare” scene. I can’t tell you what it is without giving away spoilers, but it was my favorite scene to write. It’s pretty exciting and marks a big turn in the story. And that’s all I’m going to say about that! I actually JUST finished the entire Harry Potter series. I was WAY behind all the hype. I resisted it for a long time, convincing myself that I wouldn’t like it because I wasn’t into all that magical stuff. Then my friend (who’s a HUGE fan) finally talked me into reading it and I was instantly hooked. As a writer, I could really appreciate the complexities of storytelling that J.K. Rowling was able to accomplish in that series. My laptop! My whole life (and career) is on there! Yes! I can’t wink my right eye. It’s the weirdest thing ever! My left eye winks like a pro, but the right? Nothing! Yes! I have a terrible recurring dream about my teeth falling out. I hear this is actually a very common dream, especially for control freaks (like myself!). I think it symbolizes loss of control, but I’m open to any other interpretations if you want to offer one! Congrats to Jessica on her new release--I'm definitely checking this one out myself, and you should, too!